We had intense storms and roiling clouds, which make for different lighting and dramatic backdrops. I was wondering what to do with the day. There was no chance of getting into the redwoods for a hike. So, off to San Francisco with the camera I went! It paid off. I was able to find good parking on the Embarcadero and to wander around looking for shots. 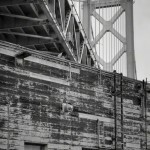 The photo of the Bay Bridge is one of a series taken from similar spots over time with different skies. 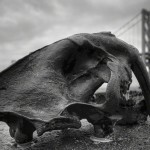 The skull is a relatively recent addition to the Embarcadero, and is part of a new exhibit describing the natural history of the area. This is the first time I’ve seen it, let alone photographed it. Both of these photos are HDR composites of three photos taken at -1, 0, +1 f-stop. Typically, I would shoot these on a tripod. But, the rain was coming down fairly hard, and I wanted to protect both me and the camera. That meant keeping the camera under my rain jacket (a Marmot Precip) and taking it out only when I had mentally composed the shot. HDR is a crap shoot in hand held mode. Very subtle changes in the subject can negatively impact the HDR results dramatically. And, not in a good way. It is impossible to get exactly the same pixel alignment without the use of a tripod. Nevertheless, it was certainly worth a try. These photos were both processed using PhotoMatix Pro 3.2.6 from HDR Software. This program does an excellent job of aligning images based on features or horizontal/vertical shifts and did well adjusting for the slight variations in these hand held shots. Of course, HDR processing can provide many different types of range compression. I wanted to bring out the clouds, which are much brighter than the rest of the image without introducing the typical HDR-like halo effects. Each was processed slightly differently within PhotoMatix by adjusting the tonal mappings. No two shots are exactly alike in how the dynamic range is compressed. I’ve found that playing around with all the adjustments is the only way I can get the effect I want. They were then saved as TIFFs in Adobe RGB space, imported to Photoshop CS5 Extended for additional editing. In the end, it was a fun way to spend a rainy afternoon!